A COMPLETE outsider won yesterday's Argentina Grand Prix after a hard-fought battle with veteran Valentino Rossi - Spain's Alex Rins roared to victory for the first time ever in MotoGP ahead of the seven-times world champion from Italy. From the start, the race looked set to be a clean and comfortable win for Marc Márquez who, since his rookie year in MotoGP in 2013, has only once failed to snap up the world championship spot, but an uncharacteristic error of judgment on the 12th bend saw the Lleida-born prodigy bite the dust. Having won every Argentinian Grand Prix since his début at this level, Márquez was completely unruffled by the presence of Brit Cal Crutchlow and his one-time hero and arch enemy Rossi clamped to his tail - swiftly putting a distance between them, he had gained a three-second advantage on both by the time he took the 12th bend too wide and slid, forcing him to scratch from the competition. From that point, it did not look set to be a successful race for Spain at all - Mallorca-born Jorge Lorenzo, Márquez's Repsol Honda team-mate, was forced to withdraw due to mechanical problems, whilst both Maverick Viñales and Joan Mir were penalised with a ride-through after having touched the tapes before leaving the grid. 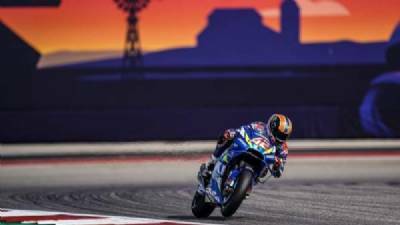 This effectively put paid to both their chances, although Viñales sealed his own fate with his long-lap error after failing to hear the message over the radio properly. But an unlikely twist was waiting in the wings: with only Rins and Rossi at the front, the result looked a foregone conclusion - but the Catalunya-born unknown quantity made history for himself. Riding very aggressively and at a breakneck speed, he managed to squeeze past the Italian four laps from the end and hung onto his lead valiantly with Rossi right on his tail. The relative newcomer has never yet graced the podium at Grand Prix level, but his exceptional performance and determination could mean a sixth world championship for Márquez is not necessarily set in stone.